Internet jokes abound about yarn shopping/hoarding addictions. I laughed, you laughed and then probably we all headed over to Joann’s website to look for sales. Reviving crochet in my life has changed my habits of consumption. Prior to becoming a yarn addict, I tried hard to avoid buying anything new, joining The Compact for a year and striving to curb my use of plastic – thanks for the inspiration, Beth Terry. Then just like that, I found myself gleefully in the checkout line of big box craft stores with pounds of acrylic in my arms. China, Turkey, wherever the yarn is made and whatever the worker was paid didn’t matter because I’m going to make something myself. Doesn’t that offset it? But it turns out it does matter. Where did that yarn come from? Are the little pieces of plastic shredding off my acrylic hoard hurting people and wildlife? What if I’m contributing to cancer by crocheting caps for chemo patients due to the chemicals used to treat and dye the yarn? Sorry, Debbie Downer I know, but I never answered these questions despite them being in the back of my mind always. I’d rather just sick my fingers in my ears and wait for the next flash sale. So what’s the answer? I hope to find out. For now, I’m going to try and resist temptation and use up what I have here (said no one ever). Maybe I will finally start making t-shirt yarn, exploring the world of upcycling thrift store sweaters and supporting small companies that hand spin and dye natural fibers. Is that the way to go? Could I really do it? I think I am caving already! 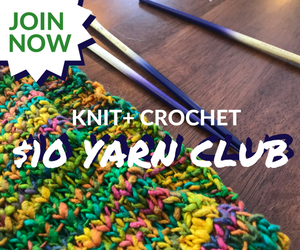 Can you really become a green crocheter or knitter? Maybe I just need to get one of these guys as a pet. Please share your thoughts with me in the comments section. LOL! Going green is great, but each person has his own thing that is hard to give up! I think being aware of the problems out there and spreading the desire to even start making changes makes a huge difference. HI Nooria, That’s a great way to look at it. Thank you for stopping by! It’s true! You can’t just go to the store and get organic handspun yarn, so I can see it becoming a treasure to the anyone’s stash. I think it’s great that you are taking all this into consideration. It’s so easy not to give any thought about where the products we use come from. Looking forward to learning some green crochet projects. I agree Jamila, it is too easy to not think about these things. Crochet has really made me think a little more. I’d really like to be a “yarn snob”. I’m just not sure if I can afford it. I’m gonna try spinning my own yarn, if I can get the hang of it maybe I’ll become my own yarn supplier. We all have dreams lol! It’s not particularly difficult to find American Made yarns. Red Heart is everywhere, inexpensive and it’s US made. I’d wager the acrylic yarn you bought already that you thought was made in China was actually made in the US. If you are concerned about the plastic in the Acrylic, there are a large number of small US farms producing wool in small batches, I’ve never had any trouble finding US made yarn, or yarn with organic dyes. Sarah, That is very good to know that it hasn’t been hard to find local and/or organic yarn. I haven’t used Red Heart too much. Maybe I will give them a second look. Thanks for the heads up! It depends on where you live, but I have definitely found plenty of local farms that do low volume production of beautiful un-dyed, natural fiber yarns from their animals. There are even companies like Alpenglow Yarn that produce beautiful yarns with natural dyes (I just got to see them in person at Stitches West).A Verb For Keeping Warm just came out with their own line of locally produced wool yarn called Pioneer, and they are even working towards having it milled locally. My advice for greener knitting is to buy what you need one project at a time and commit to spending a little more for special fibers that not so mass produced. Thank you Stephanie, that is fabulous advice. I will look up the companies you mentioned. I haven’t really thought to check if anyone local made yarn. Worth a shot to check out. Thank you for your comment.